The speaker equivalent circuit is the actual core of the theories crafted by Thiele and Small. Every component of a speaker can be “transformed” into an electrical component, to form a circuit that acts exactly the same as the speaker. The electrical domain is characterised by the voice coil with a given DC resistance and self-inductance, Re and Le. As mentioned the electrical signal is converted to a mechani- cal motion. The strength of this coupling from electrical to mechanical domain is related to the force factor Bl, which is the product of the magnetic field strength of the static magnet in the voice coil gap, B, and the length of the voice coil (eg. the wire) in the static magnetic field, l.
The mechanical domain is characterised by the mass, MMD, of the diaphragm, the com- pliance, CMS, of the suspension and a mechanical damping, RMS. The mass, the com- pliance and the damper will introduce a resonance frequency, fS, with a given Quality factor, QMS, the mechanical Q-factor. At the resonance frequency the driver will reach its’ maximum impedance. The electrical domain is also characterised by a Q-factor, QES which is dependent on Bl, Re, MMD and CMS. Combining the mechanical and electrical Q-factors results in a total Q-factor known as QTS. The mechanical motion is converted to acoustical sound through the diaphragm and the strength of this coupling is related to the area of the driver diaphragm, SD. The acoustical domain is characterised by the acoustical impedance in front, ZAF , and behind , ZAB, the diaphragm. Normally a loudspeaker will be mounted in some kind of enclosure and therefore a parameter known as the volume compliance, VAS, is introduced. The volume compliance corresponds to the equivalent volume of air which, when com- pressed by a piston having the same area as the driver diaphragm, will have the same compliance (mechanical spring) as the mechanical compliance of the driver suspension CMS. All these parameters are known as Thiele-Small. These parameters are normally given in datasheets for drivers and are used when designing enclosures for the the loudspeaker driver, eg. cabinets. are the electrical self inductance and the DC resistance of the voice coil. Since the driver is mounted in free air the acoustical load will be the same on each side of the diaphragm and therefore it can be neglected. A closed box loudspeaker is a simple loudspeaker configuration where the driver is mounted in a sealed enclosure. 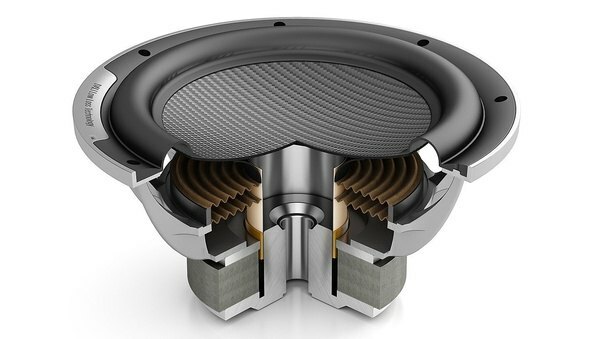 When the loudspeaker driver is mounted in an enclosure the acoustical load on each side of the diaphragm is unequal and therefore the acoustical part must be taken into account. The volume of the enclosure, Vab, works as an acoustical compliance (spring) and can be modelled with the inductor, Lceb, in the electrical equivalent circuit. Reb corresponds to the mechanical damping, Re are the electrical self inductance and the DC resistance of the voice coil. This introduces a new parameters known as the compliance ratio, α. α is simply the ratio between the equivalent volume and the volume of the enclosure which the driver is mounted in. This additional volume compliance will add up together the equivalent volume compliance and shift the resonance frequency and quality factor of the system. The vented box loudspeaker is also a very common speaker which uses an additional resonance frequency, generated by a vent in the box, to increase the low frequency output. The vent in the box introduces an additional resonance frequency, fb. The mass of the air in the vent will resonate with the volume of the enclosure. This type of resonator is known as a Helmholtz resonator. The mass of the vent can be modelled as an capacitance, Cmep in an electrical equivalent circuit. The vented box enclosure quality factor, QL, is related to the enclosure leakage resistance which can be modelled as a resistance, Rep in the electrical equivalent circuit.